Peggy's Bed and Breakfast is a non-smoking establishment. We will hold your reservation with either a MasterCard or a Visa. Once you have confirmed availability via e-mail or telephone, you can provide your MasterCard or Visa information to us via our Secure SSL Form. We encourage you to provide the credit card information quickly. See the IMPORTANT notice below. Great minds must think alike. At many times of the year we get calls only hours apart asking about the availability of a certain date. IMPORTANT: It is our policy that the first party to provide their credit card information receives the reservation. If you want to call back later, we understand, but by doing so you do risk losing the date. In addition, reservation cancellations MUST be received two weeks in advance or we will charge your card for the time reserved. We have only one cottage to rent, which makes our reservation policies firm. Thank you for your cooperation. Weekends fill up fast year round. We take reservations to a year in advance. As mentioned above, we do need a credit card and telephone number to hold your reservation. Here's some good news: if you stay at one of the large chain lodgings along the highway, you'll pay 6% sales tax, 3% piggy-back sales tax, and 5% bed tax. That's 14% added to your bill! Stay with us and save! Our sales tax is 0%. Our piggy-back tax is 0%. Our bed tax is 5%. Stay with us and save 9%... and have a cottage all to yourself. I didn't want to do it, but I had little choice. I knew this day was coming. It's sad, but I've had to raise my rates. I think it's been almost ten years since my last increase. Been to the grocery store lately? And how's your energy bill? As many of you know, the romantic fireplaces at my wonderful little hide-a-way are fueled with propane. The cottage is made comfortable with electric heat (as is the water), and the gourmet breakfasts are apparently made of gold. Ever notice that the food that is touted as good for us is also the most expensive? You would think fruits and vegetables would cost less than the processed junk. The cold, cold winter killed off the Florida oranges. Some bug has clobbered bacon, and, worse, I hear that our Ashtabula County grape crop is just a shadow of its former self. That's adding insult to injury. Drowning one's sorrows in alcohol should not be cost prohibitive! Full Breakfast served between 7 and 11a at the cottage. Note: By law, the food consumed at breakfast is taxable, but Ohio law allows us to charge tax on the 'food consumed' only (meaning not on the room) if we are able to designate the food cost. With that thought in mind, the rooms rates above include a five dollar breakfast charge per person. As a matter of simplicity, we have chosen to pay the breakfast tax for you. We do appreciate your business. Join our mailing list! We will never provide your e-mail address to anyone. Northeast Ohio and Ashtabula County are without rival year round. 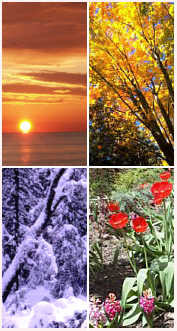 Each of our seasons offers its own special Oooh and Ahhh. Cool morning? Our porch fireplace can make your breakfast a special warm and comfy treat, while our indoor fireplace provides just the right atmosphere for popcorn and a movie. If it's absolutely to hot to handle, our window air conditioner will keep you as cool as you need to be. Peggy's offers Gift Get-A-Way Certificates sent to you or to an address you provide. Visit our Gift Certificate Page for ordering. Gift Certificates are also available via the telephone or e-mail. Need more information? E-mail us with your questions.